There are lots of sports movies out there, and some are iconic for a particular sport: hockey has Slap Shot; baseball has Major League,The Natural or Field of Dreams; football has Any Given Sunday, Friday Night Lights, and Rudy; boxing has a ton including Raging Bull and the Rocky series; basketball has Hoosiers; and the list goes on. But lacrosse didn’t really have anything; there hasn’t really been a movie that included lacrosse as an integral part of the film. Any mention of lacrosse in movies such as American Pie was generally tangential, and usually involved US prep schools. And there has certainly been no film that looks at lacrosse from a Native American point of view. Until now. The plot of Crooked Arrows isn’t exactly groundbreaking. It follows a relatively tried-and-true formula that has worked in a number of other sports movies, that of the underperforming team that gets a new coach / owner / manager who turns things around and makes them champions. Think Major League with middies. The difference here is that at the beginning, the coach doesn’t particularly want to be there either – so rather than Major League, perhaps A League of their Own might be a more apt comparison. Gradually the players start to adapt to their new playing style and gain confidence in their coach and themselves, and the coach realizes that he needs the team as much as the team needs him. The coach in this case is Joe Logan (played by Brandon Routh, who has distant Native background), a half-Native whose father is on the tribal council. Logan is a former lacrosse star who is coerced by his father into finding his spirit by returning to his roots and coaching the reservation’s hapless lacrosse team. As you would expect, he encounters resistance and is pessimistic about his chances of success but gradually wins the team over. After that, it’s fairly predictable: most of what you might foresee happening does happen, and nothing really happens that you don’t see coming. That said, I didn’t care how predictable it was. Even if you know the destination, how you get there can be entertaining and fun. There were a number of funny lines, particularly the stuffy rich mom of one of the prep school players who asked “when did the Indians start playing lacrosse anyway?” or the double-entendre “wisdom” of the coach – “if you don’t go into the forest, you don’t have any balls”. The characters you’re supposed to dislike (opposing team’s coach and players, greedy developer) are sufficiently slimy, and you do like the characters you’re supposed to like (coach’s sister and father, love interest, team benchwarmer). The scenes of lacrosse practices and games are exciting, and though they don’t go over the game in much detail (this is a film about the team and the community, not so much about the game itself), you do get a pretty good idea of how fast and exciting lacrosse can be. You find yourself cheering for the Crooked Arrows and are genuinely happy when they are successful. When I saw the film, I was curious how accurately the Native issues in the film were portrayed. I have no Native blood in me, and I’m not even sure if I’ve ever set foot on a Native reserve, so I can’t personally speak to that. But I did talk to someone who can, and was assured that the movie was accurate and realistic. The reservation in the film looks like any small town in rural America, so anyone looking for fields of tepees and wigwams may be disappointed, as they would be on a real reservation. But the fact that Natives are featured so prominently in a so-called “Hollywood” film is somewhat unusual in itself. Another recent movie that includes Native Americans in a prominent role is the popular Twilight series, and indeed the actor that plays Joe Logan’s father in Crooked Arrows also plays Jacob Black’s father in Twilight. I did notice that the Native characters in this film seemed a lot more upbeat and generally happy than the grumpy werewolves in Twilight, though I suppose if there were vampires living nearby I might be grumpy too. One thing I really liked was the juxtaposition of the scenes of Native warriors from 800 years ago playing lacrosse with scenes of the Crooked Arrows team playing now. This was a very effective way to remind the viewer about the history involved with the game and the fact that to the Native community, lacrosse is not just a fun game or a sport that they invented, but an integral and important part of their way of life, and has been for hundreds of years. 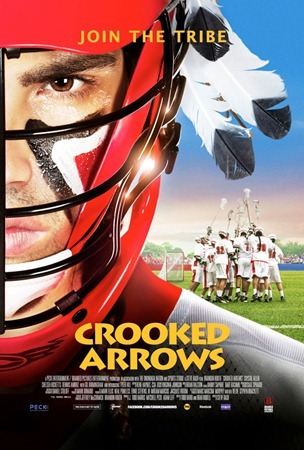 Those in the lacrosse community have known this movie was coming for a while now, and the @crookedarrows twitter account was quite active in keeping followers informed on the progress of writing, casting, filming, post-production, and when and where the movie was playing. The filmmakers even managed to squeeze in a few cameos including some of the biggest names in lacrosse: Zack Greer, Brodie Merrill, Paul Rabil, and Gary Gait (though Gait wasn’t mentioned by name as the others were). In a nutshell, I really enjoyed Crooked Arrows, as did my sons (12 and 10). Lacrosse fans will enjoy the action, but you don’t have to be a lacrosse fan to enjoy the movie.